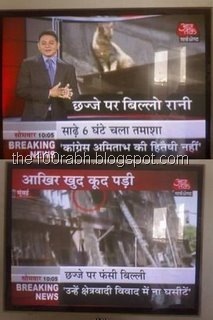 If you thought Indian newspapers were crass then wait a minute, the news channels are better than them. They are in a mode of one upmanship and each channel does its best to get the breaking news first. Here is a small sample of it taken from here. Breaking news 1 : Rahul Gandhi has dal-puri and veggies. 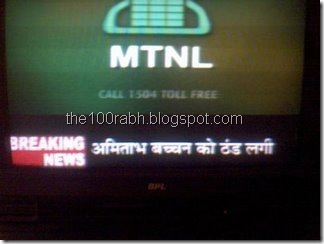 Wow thats an awesome news and a must breaking news. This news has surely made my day. Now I can indulge in Pizzas to my heart content. 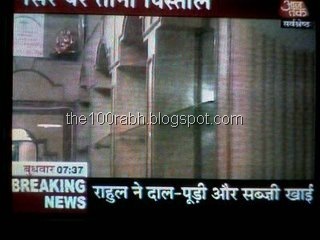 Breaking news 2 : Mr Bacchan has got cold. Oh so sad. May be I should do something immediately, like hang myself. Probably I should have done it before watching this breaking news. Breaking news 3 : Ok enough of celebrities, this breaking new is about a common animal. Well the household cat aka Billo Rani and her adventures at the roof. Breaking news 4 : If cat could be in news, then dogs cannot be behind. Here is a more celebrated dog, the Police Commissioners dog in news. This poor doggy got lost on 25th March. Thankfully it was found and it made it as the breaking news for the day. When will these channels realise whats actually worth the news. There is so much more worth reporting which goes unnoticed and these worthless things become breaking news. Will these channels ever learn ?? Not to mention the LIVE coverage of Amitabh's family's travel from Mumbai to Varanasi following Amitabh's mothers demise..